Bryndís Snæbjörnsdóttir, Blamí... blue yonder. November — December, 2001. Blami... blue yonder, 2001. Two channel video installation. Video projection: 2hrs02min, looped, colour, sound. Monitor video: 10min looped, colour, sound. The installation Blami... blue yonder consist of a projected video shot from the cockpit of a passenger plane as it flies from Glasgow, Scotland to Keflavik airport outside of Reykjavík, Iceland. 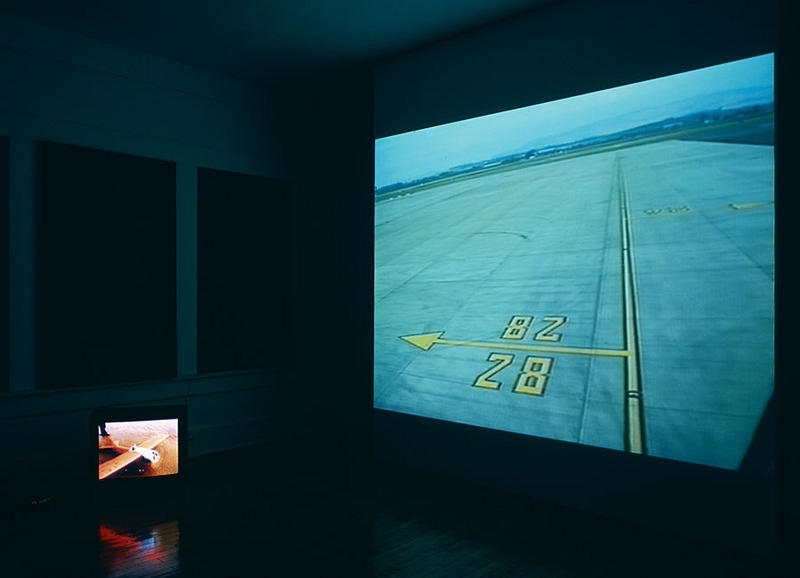 Sitting on the ground beside the projection is a monitor on which plays looped footage of a remote controlled airplane taking off, flying over an empty beach and landing. There are juxtapositions, between the monitor and projected videos, in relation to temporal and geographic scales, which Snæbjörnsdóttir utilizes to create a palpable sense of emptiness. The planes flight path takes it over nearly entirely the sea with only fleeting glimpses of islands as it approaches the airport on Iceland. This combines with the isolation of the beach at low-tide and the incessant buzzing of the remote controlled planes engine as it continuously lands and takes off results in the work having a brooding melancholic tenor. Bryndís Snæbjörnsdóttir originally from Iceland, Snæbjörnsdóttir has been working since 2001 mostly in collaboration with Mark Wilson. In both her individual work and with Wilson there is a engagement with the notion of north, and the northern, as a site of cultural, historic and environmental concentration. Snæbjörnsdóttir's has exhibited widely, venues include: Tramway, Glasgow, Scotland (2004); Reykjavík City Museum, Iceland (2003); and Maritime Museum, Exeter (1999).